Although the cast is mainly a herd of sheep, a recent film delivers a profound portrait of struggling humanity — and a last glimpse of the American frontier. The documentary “Sweetgrass,” produced by Harvard filmmakers and husband-and-wife team Lucien Castaing-Taylor and Ilisa Barbash, is a moving, gritty, and visually stunning look at the life of some of the last cowboy herders in the American West, where animal, man, and land intersect. Projecting a subtle intimacy and a rawness that only real life can offer, the film depicts the grueling trek made by a group of ranchers as they herd 3,000 sheep though the Absaroka-Beartooth Mountains in south-central Montana to feed in higher pastures. The pair met while in graduate school at the University of Southern California in the late 1980s and have since collaborated on projects as varied as “In and Out of Africa,” an examination of the African art trade, and “Made in USA,” a film about sweatshops and child labor in the Los Angeles garment industry. Their latest book “The Cinema of Robert Gardner,” explores the work of the ethnographic filmmaker and former director of Harvard’s Film Study Center. “Sweetgrass” lands directly in that category. It’s “an unsentimental elegy to the American West,” and a tribute to a dying way of life. When the couple learned of a Montana rancher who was the last in his county to continue the practice of driving his sheep up into the mountains to graze in the summer, they quickly decided to investigate. In 2001, they moved their family from Colorado to Montana, planning to make the trek into the mountains together. But with two young children and a dangerous predator problem at higher elevations, Barbash stayed in town to film, while her husband headed into the hills. When he returned, they realized they had begun two separate pictures. They chose to focus on Castaing-Taylor’s footage. “I couldn’t believe there was anywhere that remote in the lower 48,” Castaing-Taylor, a current Radcliffe Fellow, told a crowd at a March 5 screening of the documentary at the Harvard Film Archive. During the project, the couple shot additional winter footage and the spring lambing and shearing season. It took eight years to cull through and edit 200 hours of work. The finished product offers a stirring look at a disappearing livelihood and presents the complex dynamic between man and animal amid a lush and lonesome landscape. The camerawork and the absence of narration lend the documentary a powerful voyeuristic component. Instead of a voice-over, audiences listen in on a conversation between a herder and his horse, or the furious tirade of a lone herder, desperately trying to corral his wayward flock, or, simply, the constant bleating of sheep. Camera angles that range from sweeping panoramas to tight shots of the herd at ground level add to the sensory feel of the film. 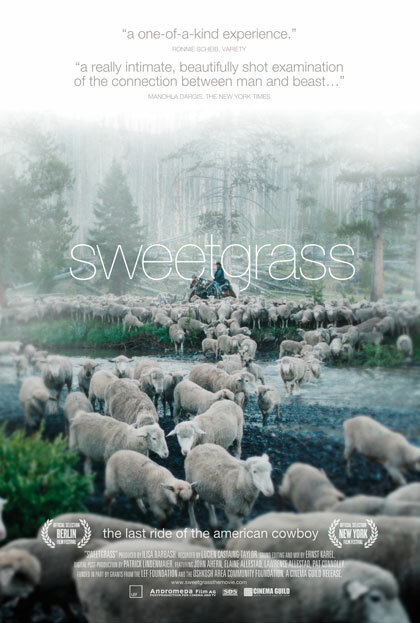 The result is that “Sweetgrass” doesn’t so much tell a story as drop you right into the middle of it. Castaing-Taylor is an associate professor of visual and environmental studies and of anthropology. Once associate director and now director of the Film Study Center, he is currently on leave while he completes the film project, and works on a series of still photographs from Montana, as well as a new sound and video project involving contemporary pastoralists in the Alps and the Pyrenees. For the couple, “Sweetgrass” is also an artistically innovative version of a well-known and ancient genre. It adds depth and realism to the generic notion of the traditional and idyllic pastoral theme. “From Virgil to Wordsworth and beyond, you never get any sense of how hard it is to be a shepherd, what kind of work is involved in managing animals, or indeed any embodied understanding of the whole human-animal interface,” said Castaing-Taylor, who noted that the iconography of sheep is “romanticized and sentimentalized” in Western culture, and looms large in religions such as Christianity, Judaism, and Islam. COLLEEN WALSH. March 18, 2010. Harvard Gazette.